The season started as a three-way fight between Bill Brack, George Eaton and Eppie Wietzes but after opening a narrow championship lead, Eaton dropped out to focus on the Can-Am Championship. Once Wietzes had fixed his problem with rear wing failures, the Thornhill driver won the next three races on the series western tour but a succession of second placed finishes lifted Horst Kroll into contention. After Wietzes retired from the Harewood Acres races, Kroll was just one point behind him with Brack, who had limped to victory with a broken suspension arm a further eight points behind. Brack then crashed in a US Formula A race at Lime Rock, badly damaging his Lotus 42B and he had to hire Al Pease's Lola T140 for the rest of the series. Kroll led from the start at Trois-Rivières but he crashed and when Wietzes' engine started to overheat, Brack took the lead. Again his suspension broke and Rex Ramsey took over to win fortuitously in his LeGrand Mk 11. Brack took pole in the penultimate race but spun, handing the lead to Wietzes. Brack managed second but Kroll fell back with overheating, leaving Wietzes with an almost unassailable points lead. Wietzes won again at Mosport in the final race to take a deserved title. The series was help over nine races and used a 9-6-4-3-2-1 points system. Points table from Track & Traffic December 1969 p41. The points table denoted Craig Hill, Don Merriman and Al Justason (but curiously not Dave Ogilvy) as "Formula B Championship", implying that a separate championship was being held for the junior class. .
As well as Brack's Lotus, Eaton's McLaren and the Lola T142s and T140s of Wietzes, Kroll and Pease, five Canadian-built Formula As also appeared in 1969. 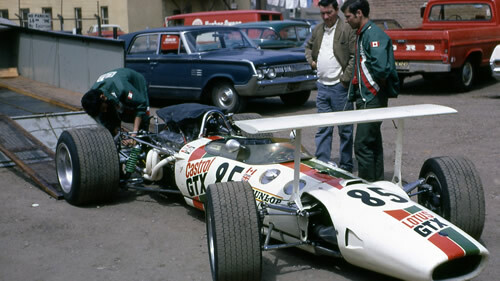 The Chinook company built three cars for Nat Adams, Brian Weightman and Alfred Ruys de Perez; a Kiki Mk 6 appeared in the hands of Tony Simms and Frank Salem drove a Ferret Mk 2, based on a McLaren M1A Can-Am car. Results for this series have proved very difficult to complete, due in part to the poor coverage in Canadian magazines such as Track & Traffic. Wolfgang Klopfer has provided Autoweek reports, Don Markle uncovered much material in the CMHF Archives, Jim Ibey found what he could from Track & Traffic and Tom Johnston has provided scans of entry lists and reports from a variety of sources. Complete results have been found only for one race, the second round of the series at St Jovite 25 May 1969 which was covered in full by Autoweek.